Snyder comes to her interpretation via a sustained allegorical arc running through the play about the role of language in Richard's destiny. The word "tongue" appears 16 times in Richard III. Sylvia: Rrrrr-Wroof! Wroof! Rrr-Wroof! Errooo-Wroof! NextStop Theatre Company, The Industrial Strength Theatre, Herndon, Va.
Two plays, alike in title: William Shakespeare's Richard III. Both opened on the same night within 25 miles of each other, one at the venerable Folger Theater on Capitol Hill in downtown Washington, D.C., the other by the fledgling NextStop Theatre Company in suburban Herndon, Va. The Folger version, the first production ever to be presented in the round there, follows a more traditional course in featuring a "halting" Richard with a limp, though director Robert Richmond takes a few liberties with his management of the other characters. The NextStop version, in a studio theater, turns the title character into a Deaf man, and director Lindsey D. Snyder takes liberties with her management of the other characters to accommodate Richard's hearing impairment. In this tale of two Richards, we look at two approaches to the play: one inside out, the other outside in. One production mines Shakespeare's text for allegorical relevance and achieves resonant theater as a result; the other has its thematic arc imposed upon it and relies on gimmickry for its dramatic value. Which is which might surprise you. For the review of Folger Theatre's Richard III, click here. Richard (Ethan Sinnott) signs his "Winter of discontent" speech as his Shadow in the mirror (Daniel Corey) speaks the speech in NextStop Theatre Company's production of Richard III. Richard is portrayed as a Deaf man, and Shadow interprets his soliloquies. Photo by Rebekah Purcell, NextStop Theatre Company. The action opens with King Edward IV giving his ascension speech from the end of William Shakespeare's Henry VI, Part Three. Edward's younger brother, Richard, Duke of Gloucester, has something to say, too, and he starts in with "Now is the winter of our discontent made glorious summer by this son of York." But the assemblage is departing and nobody takes note, even as Richard, who is Deaf, stamps his foot. And so, he turns to his reflection, his Shadow. This inner voice knows all, and through him, so do we. Playing the title character of William Shakespeare's Richard III, Deaf actor Ethan Sinnott returns to the stage after a 15-year absence, during which time the director of Gallaudet University's theater program has made a name for himself around the D.C. theater scene as a set designer and director. In making the iconic hunchback Richard a Deaf man instead of someone with scoliosis, as the discovery of the real Richard's skeletal remains confirmed, director Lindsey D. Snyder is creating for herself a challenge on a number of fronts: the risk of appearing gimmicky, the obstacles of using deafness as the central theme of a play that relies on soliloquies and very public orations, and the notion that deafness is a deformity, which the Deaf community vehemently rejects. Deafness and other physical and mental disabilities, however, are perceived deformities among the nondisabled population. "My interest in exploring a world where Richard is Deaf comes not only from a long and life-changing relationship with the Deaf community and culture, but from an interest in exploring a world where a perceived disability drives expectations," Snyder writes in her program notes (emphasis in original): "Not only the expectations of society on an individual, but the expectations of an individual of himself." In addition to directing, Snyder is an adjunct professor at Gallaudet; her doctoral dissertation is titled "Sawing the Air Thus: ASL Translations of Shakespeare and the Echoes of Rhetorical Gesture." To stage the interpretations of Richard's soliloquies and conversations, Snyder concocts two keen stage conventions. First, she draws on the many metaphors of shadow and reflection Shakespeare uses in the play to create the character of Shadow. Scene designer JD Madsen's set is a range of Mediterranean villa–style walls with peeled plaster and broken or missing light globes, centered by a raised plaza; the doors and windows in the walls look like mirrors, and reflective panels comprise the wall surrounding the pedestal at the center (costume designer Erin Nugent outfits the cast in 1950s-era suits and dresses). In one of the villa windows appears Shadow (Daniel Corey) to recite Richard's opening speech as Sinnott signs it. Shadow appears in the mirror and sometimes on stage throughout the play to translate Richard's inner thoughts. For Richard's public interactions, Buckingham serves as his translator, even in the opening scenes before Shakespeare first brings Buckingham on stage. This device scores on three levels: one is the engaging performance of Sun King Davis as Buckingham, another is in the demonstration of vocal quality as an influencer over others, and the third is in the portrayal of Buckingham's rise and fall as Richard's confidante. Though they are Richard's words, it is Buckingham's voice that we—and Clarence, Hastings, and, most poignantly, Anne—hear. In this production, the Lady Anne wooing scene hinges on the full application of communication, for, as Anne herself later says, "Within so small a time, my woman's heart grossly grew captive to his honey words." Sinnott's signing in this scene becomes tender, intimate, so enticing as to melt a woman's hardest heart. "Fairer than tongue can name thee," Richard says to Lady Anne, and Sinnott's signing proves it so. Playing Anne is Rachel Spicknall Mulford, a member of the Faction of Fools commedia dell'arte company based at Gallaudet, who occasionally uses American Sign Language (ASL) as she responds to Richard. Meanwhile, Buckingham's honey-coated voice is a coaxing soundtrack. Notably, things don't go nearly so well for Richard in his second wooing scene, trying to convince Queen Elizabeth to marry her daughter to him (Princess Elizabeth has a non-speaking role in this production played by Deaf actress Sandra Mae Frank). Carolyn Kashner's Elizabeth knows no ASL and doesn't care to, and Catesby (Ben Lauer) has by now become Richard's interpreter. While he certainly carries off Richard's commanding persona in his voice, he lacks Buckingham's tuneful quality. Whereas Sinnott leaps into the air in delightful victory after successfully courting Lady Anne—"Was ever woman in this humor woo'd? Was ever woman in this humor won?" he tells Buckingham—he bends over in frustrated angst over the uncertain outcome of his courting Elizabeth, and he begins yelling instructions at a flustered Catesby. Ability with ASL serves as the primary qualifier for entering Richard's circle. Catesby enters as one of Clarence's murderers, along with Frank playing the second murderer. Deaf actor Charles Ainsworth plays Tyrell/Ratcliff, and the entirety of Richard's conversation with Tyrell about murdering the "bastards in the Tower" is done in ASL with no vocal translation for the audience. 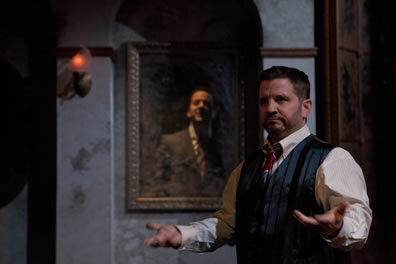 By contrast, Hastings not only doesn't use ASL, Zack Brewster-Geisz plays him as unwittingly belittling of Richard, shouting his lines at the Deaf duke and demonstratively mouthing his words (Buckingham at one point leans into Hastings and shouts in his ear Richard's reply). Meanwhile, those who straddle the worlds of the hearing and the Deaf become suspect. Catesby ends up trying to betray Richard (Snyder's twist on "My kingdom for a horse!") and loses his tongue. Buckingham's fall is more profound. Davis establishes Buckingham as Richard's truest ally, his voice in the court and his facilitator to the crown. As Richard goes, so goes Buckingham—until the latter balks at murdering the babes. With that, both Richard and Buckingham come to realize that they can never fully share their worlds, and distrust immediately takes hold. The scene of division between Richard and Buckingham is played out by Richard transferring interpretation duties to Catesby. For the audience, which has grown accustomed to the pairing of Richard and Buckingham and has come to fall under the spell of Davis' Buckingham, the impact is devastating. Not only does it portend Buckingham's demise, we also know Richard will never be as effective without Buckingham's all-in translating. The "babes" here are, literally, babes in arms; Elizabeth seems to have given birth to them less than six months apart, the Duke of York is obviously only a few days old, and mom bounced back from the birth quicker than the current Duchess of Cambridge did after Prince George's birth. This is the production's biggest misstep, though watching Tyrrell strangle the infant York is effectively disconcerting. If playing Richard as a Deaf man seems gimmicky, well, I've seen him played, successfully (and famously) on crutches, as a Dr. Strangelove-type Nazi, and with a medicine-ball-size hump. The role itself is gimmicky. Yet, Snyder comes to her interpretation via a sustained allegorical arc running through the play about the role of language in Richard's destiny. The word tongue appears 16 times in Richard III. "Because I cannot flatter and speak fair, smile in men's faces, smooth, deceive and cog, duck with French nods and apish courtesy, I must be held a rancorous enemy," Richard tells the court in Act I, Scene 3, and in this environment this is mere observation and not exaggeration. The fate of the throne hangs in the balance of the London citizens who are "mum and speak not a word." "Why should calamity be full of words?" laments the Duchess of York, Richard's mother. And when the Duchess (Marilyn Bennett) reproaches Richard on his way to battle and insists, "O, let me speak!" Richard replies with true cheekiness that earns a laugh, "Do then: but I'll not hear." "I will be mild and gentle in my speech," she says, but what of that? Even though she's Richard's mother, she doesn't use sign language, and he wants her to be brief. 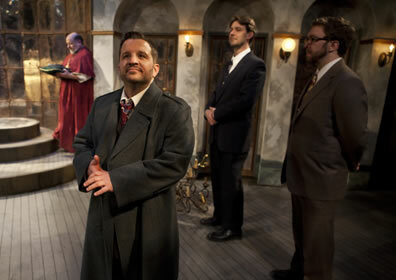 Richard (Ethan Sinnott) prepares for his coronation as, from left, Cardinal Ely (Bill Fleming), Buckingham (Sun King Davis), and Stanley (Kevin Collins) wait upon him. Photo by Rebekah Purcell, NextStop Theatre Company. Most gimmicks, including those inherent in the role of Richard, lose their way as the play progresses. However, in this production, Richard's deafness provides a huge payoff at play's end. Of the 14 stage productions of Richard III I've attended, including those with Antony Sher, Derek Jacobi, Ian McKellen, Kevin Spacey, and Mark Rylance in the title role, only one Richard remained engaging through to the end, that of Benjamin Curns in the American Shakespeare Center's 2012 production at the Blackfriars Playhouse. He had a predetermined advantage over all the others in that the ASC's Richard III was played in sequence with the Henry VI plays the previous three seasons, and Curns played Richard in those prequels. Thus, he portrayed Richard's deepest psychosis that is not only revealed in the famous opening soliloquy and subsequent post-Clarence and post-Anne speeches, but in his final soliloquy after being visited by the ghosts of his victims. This NextStop production comes closest of any other productions to achieving that standard. The ghosts appear in the mirrored windows. Meanwhile, Shadow, there to translate Richard's inner thoughts to us, is already on stage: Corey, playing Shadow, doubles as the Earl of Richmond. He and Sinnott play that final soliloquy together as a kind of dance, Sinnott signing, Corey speaking Richard's futile attempts to excuse away his deeds and find redemption in his life. "Fool, of thyself speak well! Fool, do not flatter." The schizophrenic nature of Shakespeare's script manifests in Richard and Shadow both speaking these lines, and Richard hits his deepest despair with "My conscience hath a thousand several tongues, and every tongue brings in a several tale, and every tale condemns me for a villain." It is riveting theater. Aside from Corey's solid acting skills, Snyder's choice to double him as Richmond carries thematic significance. After Richmond kills Richard and takes Princess Elizabeth as his bride, he not only pardons Richard's followers (in the script), he gives Tyrell/Ratcliff back his sword. As this Richmond is, physically, visually, Richard's Shadow, it denotes a fine line—maybe even an invisible line—between the two characters and the fact that any of us could fall on either side of that thread-width tightrope. For Deaf people watching, Sinnott delights on his own. For the rest of us, in a way, Davis as Buckingham, Corey as Shadow, and Lauer as Catesby share the role of Richard with Sinnott, and this foursome make one helluva Richard III in a Richard III that forces self-reflection in us. We complete the quintet that is Richard.